Halloween is coming and if you’ve been a part of our little community for long, you’ll know that it is one of my favorite holidays. I love taking the opportunity to scare the pants off of my family as is evidenced by my DIY Serial Killer Bathroom Decor. Both of my daughters are the same way. At 13, they love to be scared witless and it is not uncommon for them to ask permission to watch a scary movie late at night. Because of that love of all things scary, she has been a zombie twice for Halloween in the last six years; once in a regular homemade zombie costume and the second time in a DIY zombie bride costume. When she wanted to be a zombie that first year, I was worried. I mean, I’m not exactly the most crafty person sometimes and homemade zombie makeup seemed daunting. Luckily, this is one DIY Halloween costume that is easy enough to make that anyone can do it! For this post, I’ll be telling you how to create a DIY zombie bride costume, but doing a regular homemade zombie costume is pretty much the same. The only difference is the clothing that you or your children wear. For the DIY zombie bride costume, you’ll want to have an old wedding gown to wear. We found one cheap at our local Goodwill. For the regular homemade zombie costume, old clothes will work. I’ll go into more details on the clothing later. 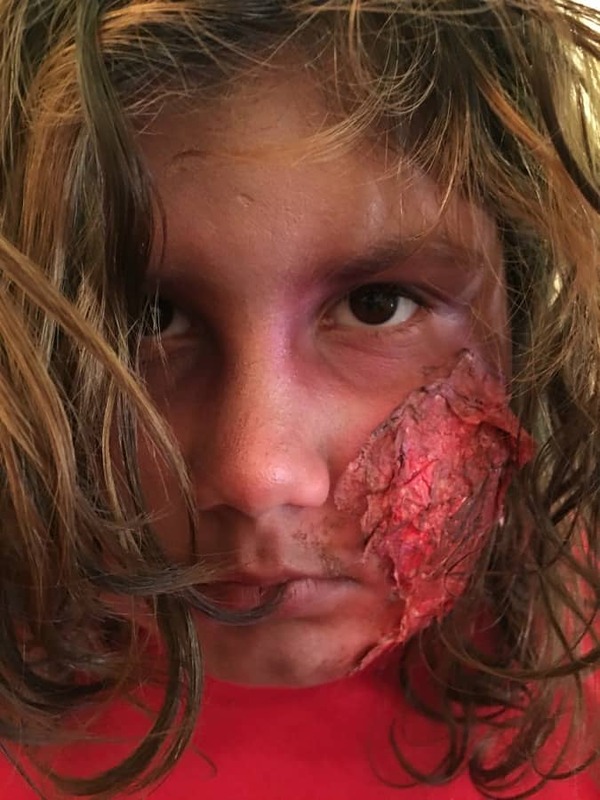 The one thing that you do need to make sure that your kid is aware of is that this homemade zombie costume does take at least an hour to do the makeup for and maybe longer if it is your first time doing it. It is totally worth it though when you see the finished product! 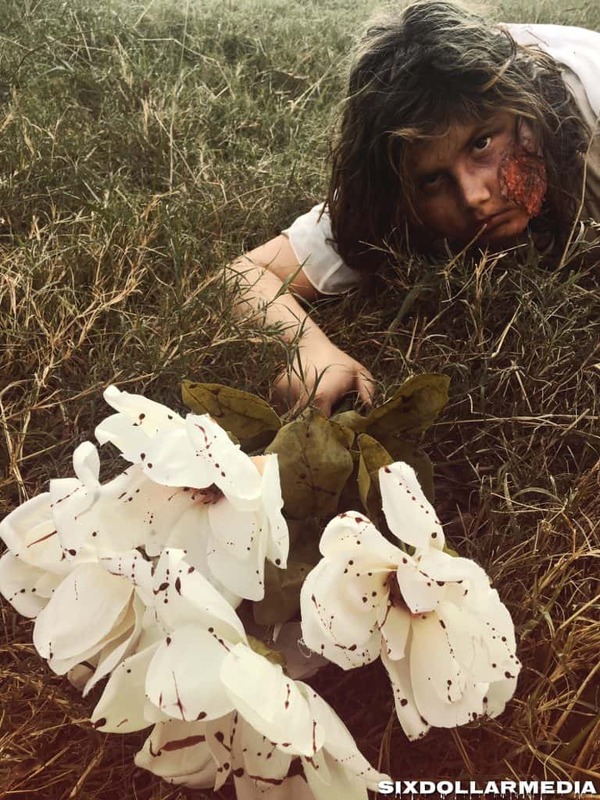 The finishing touch on this DIY Halloween costume is the homemade costume blood. If you use the one that we do, it is 100% edible for your kids. Just keep in mind that our recipe for homemade theater blood is super sweet so your kids might not like the taste. Believe it or not, my daughter doesn’t. Yes, it is sweet enough that a kid doesn’t like the taste of it. It’s super simple to make though so it is perfect for your homemade zombie costume! Now for the DIY Zombie Bride Costume! Ready? Before you begin, mix up a batch of homemade costume blood. Then, hang or lay your old wedding gown some place that you will be able to get to the entire thing. Jaggedly cut or tear a few spots in the gown to create a ragged look. Then, take a spoon and drizzle your costume blood over the dress. Allow the “blood” to fully dry then repeat with the other side. Be very careful not to get the costume blood anywhere other than the dress. Whether you use my recipe or store bought, it will have red coloring in it and may stain. Ask my door mantle. I accidentally splashed on it. While the dress is drying, make sure that your future zombie bride has a clean and dry face. Don’t worry too much about nice neat hair. Messy hair is a hallmark of a zombie so if it is too freshly brushed, go ahead and mess it up good like we did. Figure out where you are going to place the face wound before you do anything else. For ours, we went with a full cheek wound. Since I knew that the wound would end up covering some of where I needed to place eye makeup, I did the eyes first using a dark grey eye shadow. Be sure that you get not only the eye, but the area around it to create the look of a sick person with sunken eyes. Once you’ve done any makeup that you need to do to prepare for the wound, cover the area that you want to make into a wound with the Elmer’s school glue. You can use your fingers, a Q-tip or a brush to apply the glue, but honestly, your finger will be easiest. Brushes and cotton swabs leave behind brush hairs and fuzz. While the glue is still wet, piece together toilet paper to cover the glue. You don’t want it perfectly smooth. Roughing it up a bit and giving it jagged edges will give your wound a more realistic appearance. If you want your wound to have the appearance of the skin being cut and hanging off like ours did, trace more glue around the upper edge and apply toilet paper to it as well. If you notice, the skin flap is more smooth than the lower pieces. It needs to be a bit smoother to really look correct. If you need or want to rough it up more so than you did when applying the tip, you can slide the toilet paper around with a toothpick until you get it to where you want it. Allow the entire area to dry at least 90% before moving on. After your wound base is dry, use the red lipstick to color it in. You don’t need to get 100% coverage, just make sure that the majority of it is colored in. Once you’ve got that taken care of, go ahead and grab an all over face makeup brush and start to darken in the rest of the face. Don’t worry too much about getting the shading just right since you’ll be filling that in later. For this step, I use a shade of grey that is one or two shades lighter than what I used to blacken the eye area. While you’re darkening the face, go ahead and put a little of the same color onto your wound area to darken it a bit as well. If you notice, I also added quite a bit of sharing around the top edge of the “wound.” Later on, this helps to give it the depth that it really needs. Next, add some color to the entire face. For this, I use a dark green. Then, take a small bit of the lipstick and rub it under the eyes. Don’t worry if you got a bit of glue somewhere other than the wound. Once the makeup is on, it will look like dirt which only helps to cement your homemade zombie costume. I’ve also added a bit of lipstick or dark color to her chin to help create that dirty look later on. Continue to use the eye shadow colors to shade in the face making sure that you get the very edge of your wound. For this, use a dark green, purples, and grey to get the color blend that you want. Remember you’re making a zombie so you want the skin tone to be a bit…dead. For this, I use a blending brush like THIS one and simply brush like a maniac until I get the color I want. For areas that have lipstick, you may need to use your fingers to help it really blend. After you’ve got the makeup done and the hair roughed up a bit – because as I said, zombies don’t have perfectly brushed hair after all – you can go the extra step and zombify your bouquet of flowers too. This is best done outside, but you will simply do the same thing that you did with the gown. Take a spoon and drizzle some costume blood over it. Just be aware that the droplets that will form will not dry entirely so e careful when you care carrying it. Once everything is ready, slip on the wedding gown – making sure that you take care not to mess up your face – and make any final touches that you need to in the color of the makeup. As you can see in the pic above, I darkened the area around the skin flap to give it a bit of a burned appearance. I also darkened her lips and the area under her eyes again as well. One last thing; as you’re doing the makeup, feel free to experiment with the colors and shading. The photo above is from her first run as a zombie. 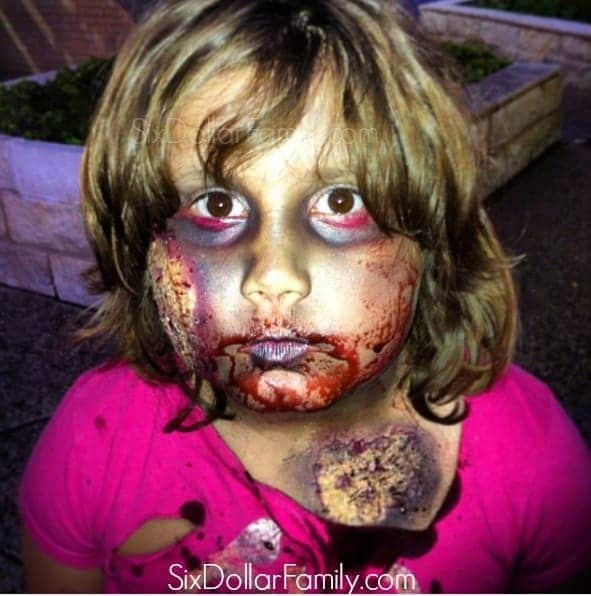 Yes, I had a 7 year old zombie. 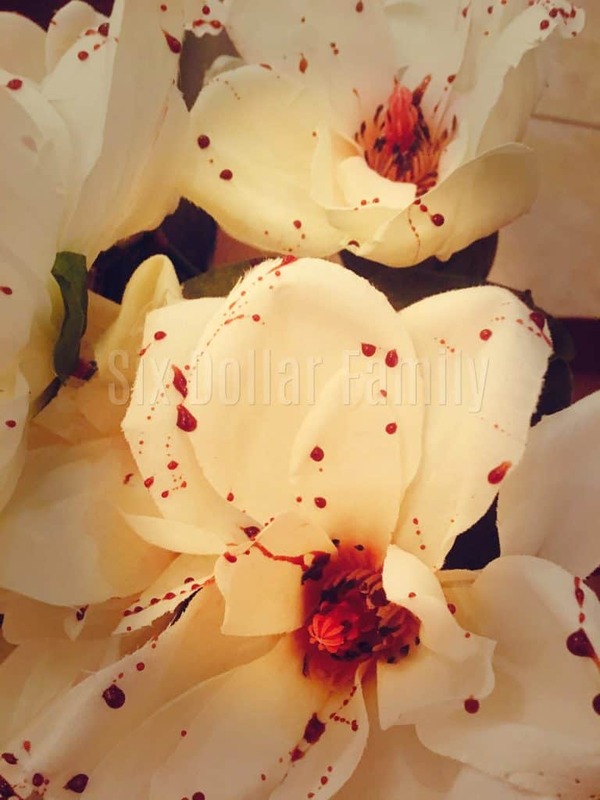 That year she had two wounds, I used more green than grey and as a finishing touch, I dipped a washcloth into the homemade theater blood and had her bite down. What it resulted in was a natural spreading of the “blood” as if she really was a zombie who was had been feeding. I also did what most parents have dreamed of doing many times and got to destroy a Justin Beiber t-shirt that day. It was pretty epic. The biggest thing to remember when making this homemade zombie costume is this; it’s a DIY Halloween costume! You really can’t go wrong with it! Have fun and enjoy your Halloween! *Originally published September 2017. Updated September 2018.